Bluegrass on the Waccamaw began in 1996 as an idea between two friends. Their thoughts were to provide a "World Class Bluegrass Music Show" and use the setting of the historic "Peanut Warehouse" on the waterfront in downtown Conway, S.C.
On May 17th of 1997 the first "Bluegrass on the Waccamaw" show was set in motion and the rest is history for downtown Conway. 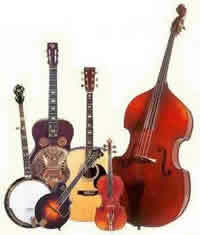 Major bluegrass bands performed the first year and each year since then. Local groups get an opportunity to grab center stage as well. With the direct, unique, and indomitable sound that is unique solely to Bluegrass music, this festival educates and entertains and keeps the culture alive. The Rivertown Jazz and Arts Festival is a celebrated arts event that takes place in historic downtown Conway SC. This festival contains fun for the whole family with great live music, lots of art and a variety of food. Live performances, ranging from jazz to gospel to steel drums takes place all day long. Festival-goers are encouraged to bring their own chairs. Every November, the South Carolina State Bluegrass Festival comes to the Myrtle Beach Convention Center. The bluegrass festival celebrates and honors this musical form by bringing together the top practitioners of Bluegrass, and presenting them in a venue that allows for direct audience participation. Jam sessions develop spontaneously, and often audience members join in. There's something simple, direct and authentic in Bluegrass Music. In a time and place that values novelty, experimentation and change-for-change's-sake, Bluegrass at its purest remains a truly original American concoction. Established in 1991, the Pawley's Island Festival of Music and Art provides a year-round schedule of quality performances, programs, and educational opportunities in music and the arts. This annual SOS Fall Migration brings shag-dancers from all over the country to Myrtle Beach, where the crazy dance was born more than five decades ago. A unique twist on East Coast Swing dancing, shag is a six-count dance pattern. During the Migration, several clubs and venues sponsor special events to welcome seasoned shaggers, as well as introducing newcomers to this thrilling craze. Even if you're not a dancer at all, watching veteran shaggers work their magic on the dance floor can be an awe-inspiring experience. You simply won't be able to stay in your seat as the music and the mood of shag takes over during the SOS Fall Migration in beautiful Myrtle Beach!